This week, a group of researchers from Columbia, Stanford and Cambridge published conclusive results that advertisements tailored to customers personalities achieve stunning increases in customer engagement. Using both language and imagery chosen to match a customer’s personality generates 40% more clicks and 50% higher conversion rates. This works even in situations where only a minimal amount of distinguishing data – a single Facebook Like, is available. 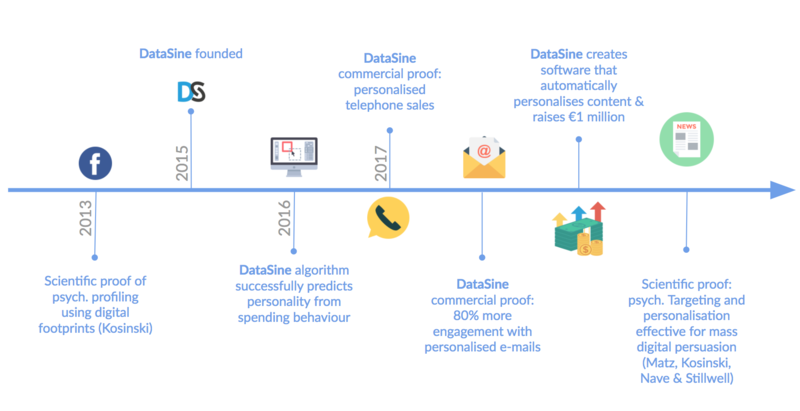 At DataSine, we have followed this story very closely, as our approach to personalisation is closely aligned to the new paradigm of personality-based optimisation proposed by Matz and her colleagues. Understandably, their research is generating extensive media commentary. We are encouraged by the results and our own commercial success has shown how businesses can increase engagement rates by up to 80% by employing the personality-based communication tools that we’ve created. In 2012, Michal Kosinski published a seminal paper proving the predictability of personality traits from Facebook likes, which at the time were publicly accessible. Building on this success, Sandra Matz and her co-authors, including Kosinski, use a single Facebook Like to separate people into groups according to the Big 5 Personality Model. The experimenters worked with graphic designers to create adverts for each personality type for several real products, using Facebook’s marketing platform to display them to each group. The resulting advertisements drove sales of the product up to 50% higher when the personality and materials were aligned. This intentionally simplified implementation improved marketing ROI by up to 76%. It’s exciting to see that companies like DataSine are implementing our technology to create truly personalised and meaningful online experiences. 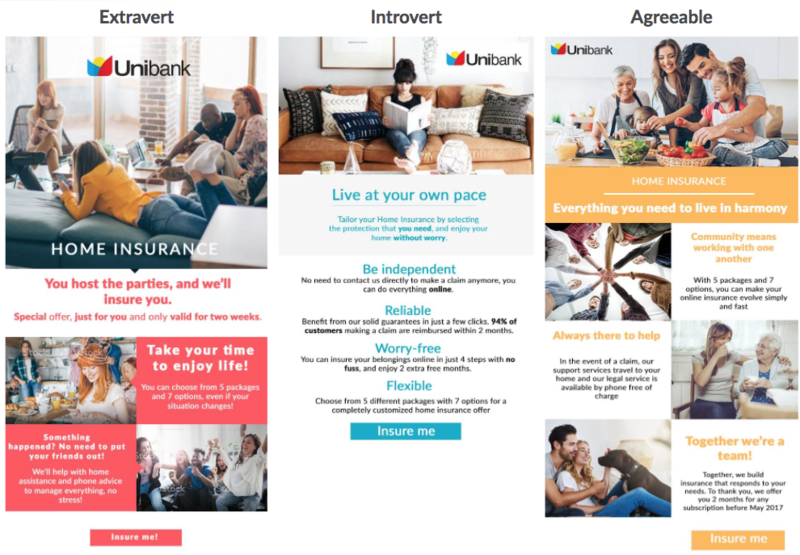 Their data-driven approach to creating customized content really takes psychographic personalisation to the next level. We are the first company to commercially apply psychographic personalisation as a method of communication optimisation. In working with clients, we see the challenges that companies face when crafting personalised outputs, the additional complexity of working with multiple content variants and finding the specialist expertise required to optimise content. Optimise content through our cloud platform which replaces guesswork with data, personalising text, images, and layout. Our software is already being used in commercial environments and in 3 different languages to increase engagement by 80%. Psychographic personalisation is a new frontier not just in marketing efficiency and ROI, but as a framework for understanding what content and products users want. We believe that smarter targeting and messaging is a stepping stone towards developing truly customer-centric thinking, which will lead to goods and services that are personalised to individual needs. Lead author Sandra Matz has discussed many of the further implications of this technology on her personal website, and numerous column inches have been spent discussing them. We would like to highlight the huge social opportunities available to organisations which aim to improve outcomes that take into account the personality of their customers. The success of ‘Nudge’ methods, popularised by Nobel prize-winning economist Richard Thaler, has empowered process architects to design systems which passively promote healthy choices. A logical next step is to actively encourage positive behaviours. Thankfully, we have already witnessed both great appetite and enthusiasm for the use of psychometrics to improve social outcomes in areas such as financial wellness and inclusion, health and more.